Deceit, betrayal, and revenge—assisted by magic potions—drive the drama in this final instalment of Siegfried’s journey. Do you need to brush up on your Ring Cycle knowledge or simply want to learn more about our upcoming production? 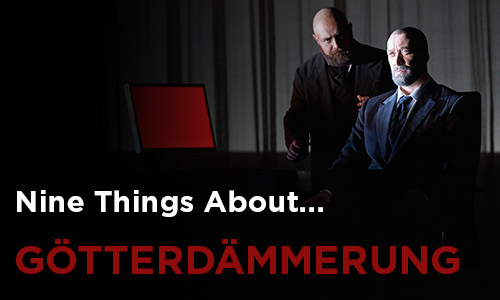 Here are Nine Things About Götterdämmerung! Der Ring des Nibelungen, Wagner’s massive cycle comprising four interconnected operas, took approximately 26 years to compose. Music critic Alex Ross has pointed out that the Ring’s entire score is “more than two thousand printed pages [and if the music were played from beginning to end] would last from morning until midnight… arguably, the most ambitious work of art ever attempted.” The COC opened its opera house, the Four Seasons Centre for the Performing Arts, with the Ring Cycle in 2006 and more recently presented three of the Ring’s four operas over consecutive seasons: Die Walküre (2015), Siegfried (2016), and Götterdämmerung (2017). In Götterdämmerung, which translates to “Twilight of the Gods,” the multi-generational epic that began with Wotan’s theft of a magic ring—precipitating a curse and prophesy of doom—comes to a stunning resolution that sees the world of gods and humans falling to the flames of destruction. Yet the end is also the beginning, as the opera leaves open the possibility of rebirth and renewal, and perhaps a better world to be remade from the debris of our faults. Götterdämmerung features some of the most complex and riveting music in the operatic repertoire, including Siegfried’s “Funeral March”—an orchestral showcase which offers a musical retrospective of the Ring itself—as well as Brünnhilde’s famous “Immolation” scene, a powerful aria in which she restores order to the world and joins Siegfried on his burning pyre in an act of profound sacrifice. Director Tim Albery’s vision for Götterdämmerung was first presented by the COC in winter 2006, and then in fall 2006 as part of the company’s full Ring Cycle. 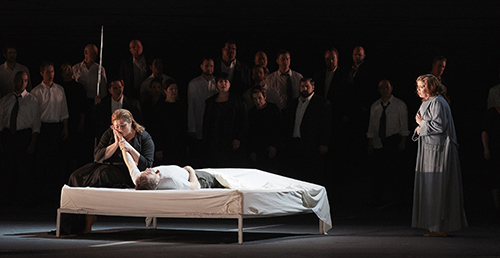 It has been called “as stunning a feat of staging as [has been] seen in Toronto” (National Post), with critics singling out that “the great virtue of Albery’s production is the urgency and absolutely clarity of the storytelling” (Opera News), while also noting the presentation as a whole represents “the COC’s proudest hour” (Globe and Mail). The production designer Michael Levine worked on all four COC Ring operas, acting as a unifying architect of the cycle and giving it a coherent visual progression from opera to opera. He sets Götterdämmerung in a world that is recognizably ours, sleekly corporate and computerized, with business suits and modern dress. Yet the use of space and shadow, the dramatic lighting by designer David Finn, also produces an undercurrent of strangeness, as if this is a world that touches ours but simultaneously remains of another realm entirely. Internationally renowned at the world’s most important opera houses, such as Bayerische Staatsoper, Opéra National de Paris, Opernhaus Zürich, Metropolitan Opera, etc. 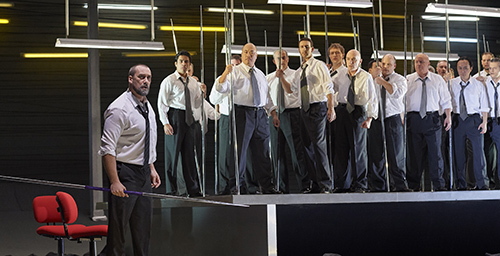 Götterdämmerung is on stage at the Four Seasons Centre for the Performing Arts from February 2 to 25. For more information and to purchase tickets, click here. 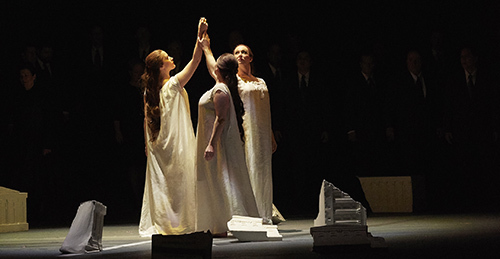 Photo credits (top - bottom): (l-r) Robert Pomakov and Ain Anger in Götterdämmerung (COC, 2017), photo by Michael Cooper; (l-r) Lauren Eberwein, Danika Lorèn and Lindsay Ammann in Götterdämmerung (COC, 2017), photo by Michael Cooper; (l-r, foreground) Christine Goerke, Andreas Schager and Ileana Montalbetti in Götterdämmerung (COC, 2017), photo by Michael Cooper; Ain Anger (far left) in Götterdämmerung (COC, 2017), photo by Michael Cooper.